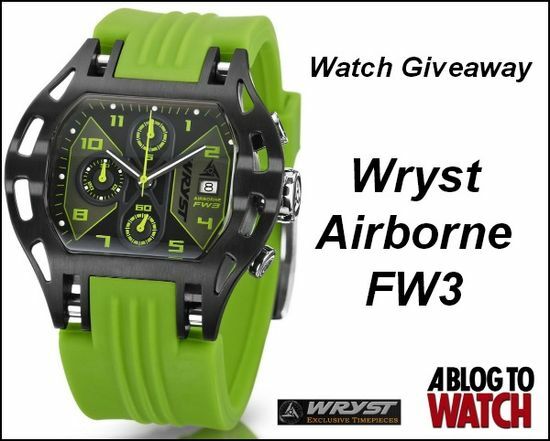 Wryst Airborne FW3 giveaway via a Blog to Watch. From time to time I’ve posted that it doesn’t matter what personal feelings I have on a watch as there’s usually someone out there that’s going to love it and since there’s only 75 of them being made I doubt I’ll ever get to use an awkward pause when someone asks me if I like their new watch:I do rather like the crown so it’s not a total loss. Anyway Tis Quartz, tis a chronograph with a dlc case and sapphire crystal which apparently emboldens the marketers to attach the word luxury to it. Yep because non thermo compensated quartz movements with silicone straps are just the thing I would expect to seen next to the F P Journe. Time marches on and thankfully that means saying YES! to a new month of watch giveaways from my favorite sites. First up is A Blog to Watch’s contest for a YES Inca watch that doesn’t just tell you the local time, but gives you quick visual access to sunset,sunrise, moonrise , moonset, phase and sure if you want to tell the local time I suppose you could use it for that too. It’s late, in February and in time tonight and so far this is the best thing I can pull up… Sad I know still you may have some thick cables lying around that could use a cable tie that also tells the time?